Individuals who wear heavy earrings might notice that the size of their ear piercing has progressively enlarged over time. Others may have accidentally torn their earlobe by catching their earring on an article of clothing. In cases such as these, Dr. Yoo offers earlobe repair. Earlobe repair is for anyone who may have experienced stretching of the earlobe due to heavy earrings or trauma. In some cases, congenital damage can also be repaired. Dr. Michael J. Yoo is an experienced, caring surgeon who can help you achieve beautiful facial symmetry. Dr. Yoo is one of the leading physicians in Orange County, CA, specializing in various corrective ear procedures. To learn more about earlobe repair or the other cosmetic procedures that Dr. Yoo offers, please contact our office and schedule a consultation today! 1 What is Earlobe Repair? 10.1 What Does This Procedure Entail? 10.2 What Is The Recovery Like For This Procedure? 10.3 Can You Pierce Your Ears Again? 10.4 Is this an Option for You? Earlobes are fragile and are easily damaged with too much pressure or weight because they’re made entirely of cartilage. Earrings are a great way to spruce up your outfit, but some that are too heavy can be too much for your ears. The wrong earrings can cause the earlobe to tear or stretch resulting in an not-so-appealing appearance to the ears. Once the cartilage has stretched past its elasticity point, the body will not repair itself. This is why many men and women seek earlobe repair. Earlobe repair surgery can help you achieve the aesthetic that you desire and restore a more youthful appearance to the ears. Dr. Yoo’s skill and understanding will help you achieve amazing results with minimal to no downtime at all. Your surgery will be unique to you and your particular case. Each earlobe will have to be examined at the time of the consultation to determine the proper technique to achieve the desired outcome. The extent of repair that is required will vary from patient to patient, which is why this procedure is so individualized. Earlobe repair can have a dramatic effect on a patient’s facial symmetry and help to improve their self-confidence. To learn more about this minimally invasive procedure, please schedule a consultation today with Dr. Michael J. Yoo. Torn earlobes – Earlobes can tear from wearing overly large or too-heavy earrings, or the piercing can be yanked after being caught on clothing, or it can be pulled by animals or small children. The damage won’t heal on its own. Stretched Earlobes – Certain piercings will stretch the earlobe. Gauged earlobes suffer from this. Larger gauge sizes create larger problems. Pixie Ear (Facelift Correction) – Earlobe shape can be warped by a facelift. The procedure can cause the lobes to appear attached to the face. Saggy Earlobes – Skin loses volume with age. This can cause the earlobes to have a droopy or wrinkly appearance. Large Earlobes – Earlobe reduction can help patients with congenitally large lobes. Perfect candidates for earlobe repair surgery are healthy men and women who are dissatisfied with the appearance of their earlobes. They may have suffered physical trauma, or their ears may have been torn or stretched by earrings. The natural aging process can also change the earlobes’ appearance, or the patient may simply wish that their ears were more symmetrical. The only way to repair these issues is through surgery. The procedure can be safely performed at any age. Your consultation with Dr. Yoo will be your chance to express your concerns and ask any questions that you have. Whether you’re suffering from an injury, a tear, or saggy earlobes, Dr. Yoo will be able to tell you if you’re a good candidate for this procedure. He will examine your ears and work with you to create a customized treatment plan that meets your exact needs. Once in our office, you will be able to look through numerous before and after pictures of previous patients who have had the procedure performed, which will allow you to get an idea of what your results will be. Every patient is different, therefore requiring an individualized earlobe repair procedure. We want you to be as comfortable as possible and are here to answer any questions you may have. Dr. Yoo will make sure that you understand every step of the procedure and ensure you have a quick and steady recovery. To schedule a consultation with Dr. Michael J. Yoo, please contact our office today! Earlobe repair surgery is a quick, painless procedure performed under local anesthesia on an outpatient basis. Dr. Yoo will use a high powered magnification to guide his eye, ensuring the best results possible. Once he has removed the excess, drooping skin, he will then delicately suture the ear closed. This will restore the earlobe back to a more youthful aesthetic. 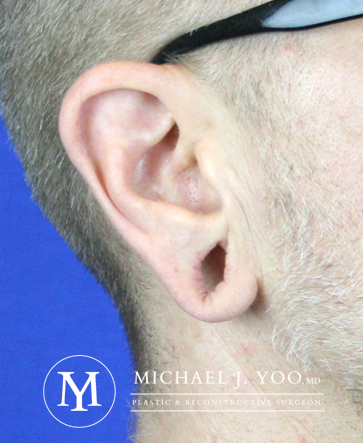 The strategy of the earlobe repair that is used by Dr. Yoo uses will depend on the injury or tear that he is treating. After he has made the necessary incisions, he will remove a small amount of tissue and suture the lobe in a Z-plasty pattern. 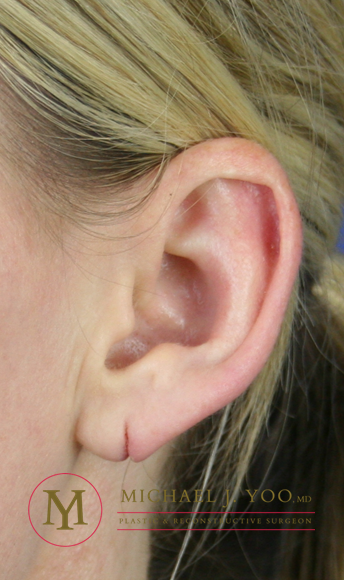 If the doctor is treating an ear that’s been stretched by a gauge piercing, he’ll suture the ear in a Z-plasty pattern after the strip of skin connecting the earlobe is cut. It takes around one hour to repair torn earlobes fully. Often, the doctor will use a layered closure technique. He’ll remove the skin from around the tear before suturing the skin on top of the ear, the skin on the back of the earlobe, and the tissue in the middle. You should be able to have the stitches removed in 7-10 days. Three months after the procedure you’ll be able to re-pierce the earlobe. Dr. Yoo’s precision and expertise allow him to return stretched out earlobes to their natural state. The procedure is more complex than if the earlobe was simply torn, but it takes the same amount of time. Dr. Yoo should be able to repair your ear in about one hour. First, the connecting strip of skin and tissue is snipped. Next, a small amount of surrounding skin is removed. This skin will be used to help reshape your earlobe. Finally, the doctor will use a Z-plasty or layered closure technique. The stitches can be removed in 7-10 days. This procedure also takes about 1 hour. Dr. Yoo will create a natural-looking earlobe by making a small cut where the lobe is attached to the face. He will then suture the earlobe in a symmetrical and aesthetically-pleasing fashion. There are a couple of viable options to correct drooping earlobes. They can be repaired both surgically and non-surgically, depending on the extent of the damage. 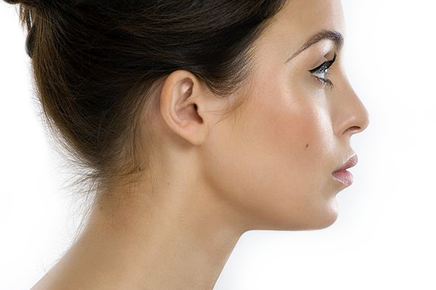 During the non-surgical procedure, hyaluronic acid is injected into the earlobes. The filler lasts around one year. If you choose surgical repair, Dr. Yoo will make a small cut in the back of your ear before removing extra skin. Fillers can be used for this procedure as well. Dr. Yoo removes excess skin and tissue to create a smaller, more symmetrical ear. One of the great things about earlobe repair surgery is how little recovery time there is. The procedure is relatively painless, and the healing is quick. You won’t need a lot of postoperative care and should be able to return to your normal life immediately. Dr. Yoo will provide you with a customized recovery plan, so you know exactly what you need to do. After your surgery, it’s critical that you keep the suture site as clean as possible. Slight swelling is to be expected and will subside naturally. Over-the-counter pain medication can ease any discomfort. If you had surgery on both earlobes, try to sleep on your back while recovering to avoid putting pressure on either of the earlobes during the initial healing period. You can start wearing clip-on earrings around two weeks after the surgery and can re-pierce your ears in 3 months. You can wash your hair immediately but make sure to be extra careful. Your earlobes should be fully healed within 1-2 weeks. If you’ve never had your ear pierced, or the hole has closed, you should wait at least six months after your surgery before getting a piercing. You should avoid heavy earrings to ensure that your results are maintained. During this time, if you have any questions or concerns, please contact our office and speak with one of our friendly and helpful members of staff. Earlobe repair is an extremely customizable procedure that is particular to each patient. Your cost will depend on your individual needs and the extent of correction that is needed. 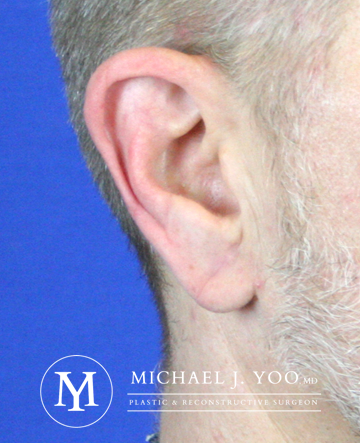 During your consultation, Dr. Yoo will be happy to provide you with an accurate earlobe repair quote. Call (949) 861-3340 or click here to set up a consultation with Dr. Yoo at our Irvine office. This is a relatively quick and easy procedure. 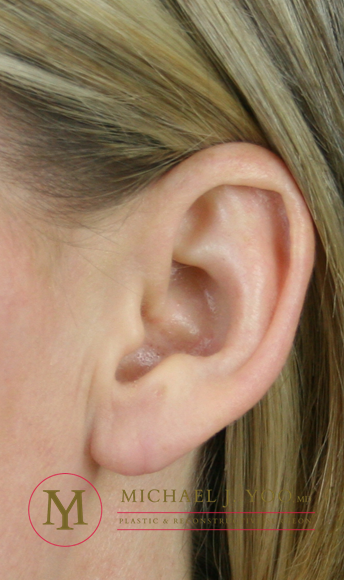 Earlobe repair requires only local anesthetic and can be performed in-office. This procedure generally involves careful removal of the surrounding skin around the stretched area to create a fresh wound. Fine sutures are then used to close the wound in multiple layers. Scarring is minimal and should be hardly visible. What Is The Recovery Like For This Procedure? After your earlobe repair, fine sutures are typically removed in 6-7 days. A thin film of antibiotic ointment is applied 2-3 times daily to facilitate healing while the sutures remain in place. Can You Pierce Your Ears Again? Ears can be pierced again after this procedure; however, waiting for a minimum of 3-6 months is strongly recommended to allow sufficient healing. It is also important to be cautious with your ears and avoid heavy earrings. If you have stretched or damaged earlobes and are interested in earlobe repair, please give my Irvine office a call or contact us here. This quick, easily-performed procedure may be the solution you have been looking for. You have options, and I will be happy to discuss them with you. Feel free to call our office today to schedule your complimentary consultation!